CheerUp Slider Blogger Template is a fresh-faced stunning Blogger Template designed for all bloggers. It features with creative, multi-concept and easy-to-use and is intended for food and lifestyle bloggers, fashion bloggers, personal fitness trainers, lifestyle coaches, cute animals lovers, architect and gardening enthusiasts, etc. 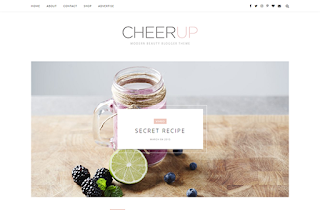 CheerUp design is vivid, fresh and modern wish makes it suitable for both men blogs and magazines and also feminine blog theme and magazines. It has a responsive design meaning your content will be displayed beautifully on all mobile devices. If you are looking for Minimalist blogger template then this is best option for you.